I am on Windows 7. Please see attached files to see issue. I am confused what to do from here. Thank you for taking time to help me. Note: If the file is too big please Zip it and upload the ZIP file to a service like Dropbox, Google Drive, OneDrive or upload to SendSpace and just provide the link for the file here. (f) CSI Unexpected Failure 0x00000005 14.0.27012.0 amd64_avast.vc140.crt_fcc99ee6193ebbca_14.0.27012.0_none_5ca6eb17137337f1 Error deleting winners map value. (f) CSI Unexpected Failure 0x00000005 14.0.27012.0 x86_policy.14.0.avast.vc140.mfc_fcc99ee6193ebbca_14.0.27012.0_none_9c229ed3ddb17764 Error deleting winners map value. (f) CSI Unexpected Failure 0x00000005 14.0.27012.0 amd64_policy.14.0.avast.vc140.crt_fcc99ee6193ebbca_14.0.27012.0_none_4f95660acc611f2b Error deleting winners map value. (f) CSI Unexpected Failure 0x00000005 14.0.27012.0 x86_avast.vc140.mfc_fcc99ee6193ebbca_14.0.27012.0_none_a93423e024c3902a Error deleting winners map value. (f) CSI Unexpected Failure 0x00000005 14.0.27012.0 amd64_policy.14.0.avast.vc140.mfc_fcc99ee6193ebbca_14.0.27012.0_none_547567fcc9354e5e Error deleting winners map value. (f) CSI Unexpected Failure 0x00000005 14.0.27012.0 x86_avast.vc140.crt_fcc99ee6193ebbca_14.0.27012.0_none_a45421ee27ef60f7 Error deleting winners map value. (f) CSI Unexpected Failure 0x00000005 14.0.27012.0 x86_policy.14.0.avast.vc140.crt_fcc99ee6193ebbca_14.0.27012.0_none_97429ce1e0dd4831 Error deleting winners map value. (f) CSI Unexpected Failure 0x00000005 14.0.27012.0 amd64_avast.vc140.mfc_fcc99ee6193ebbca_14.0.27012.0_none_6186ed0910476724 Error deleting winners map value. Edited by Jenna91, 21 March 2019 - 08:07 PM. Successfully copied file C:\Users\Admin\AppData\Local\niemiro\Archive\Manifests\amd64_08c4cc03d5b5b29afbbcab7ce73b925f_31bf3856ad364e35_6.1.7601.18489_none_aaacad37171e554f.manifest to C:\Windows\Temp\CheckSur\WinSxS\Manifests\amd64_08c4cc03d5b5b29afbbcab7ce73b925f_31bf3856ad364e35_6.1.7601.18489_none_aaacad37171e554f.manifest. Successfully copied file C:\Users\Admin\AppData\Local\niemiro\Archive\Manifests\amd64_0c4bf9da4cf4b695ac3bacf20ed5f9ec_31bf3856ad364e35_6.1.7601.18526_none_1ca1bc1c1bc7114e.manifest to C:\Windows\Temp\CheckSur\WinSxS\Manifests\amd64_0c4bf9da4cf4b695ac3bacf20ed5f9ec_31bf3856ad364e35_6.1.7601.18526_none_1ca1bc1c1bc7114e.manifest. Successfully copied file C:\Users\Admin\AppData\Local\niemiro\Archive\Manifests\amd64_0d6342e35fe04e61444714ddf9c8ecba_31bf3856ad364e35_6.1.7601.18540_none_8a88325c805794c4.manifest to C:\Windows\Temp\CheckSur\WinSxS\Manifests\amd64_0d6342e35fe04e61444714ddf9c8ecba_31bf3856ad364e35_6.1.7601.18540_none_8a88325c805794c4.manifest. Successfully copied file C:\Users\Admin\AppData\Local\niemiro\Archive\Manifests\amd64_132ad202c73640cbefaced8d146caa81_31bf3856ad364e35_6.1.7601.18540_none_62007b363fd802e0.manifest to C:\Windows\Temp\CheckSur\WinSxS\Manifests\amd64_132ad202c73640cbefaced8d146caa81_31bf3856ad364e35_6.1.7601.18540_none_62007b363fd802e0.manifest. Successfully copied file C:\Users\Admin\AppData\Local\niemiro\Archive\Manifests\amd64_1544a42c1c76fccf97c2db5b4d534686_31bf3856ad364e35_6.1.7601.18540_none_dcae18c92b47933b.manifest to C:\Windows\Temp\CheckSur\WinSxS\Manifests\amd64_1544a42c1c76fccf97c2db5b4d534686_31bf3856ad364e35_6.1.7601.18540_none_dcae18c92b47933b.manifest. Successfully copied file C:\Users\Admin\AppData\Local\niemiro\Archive\Manifests\amd64_microsoft-windows-smss_31bf3856ad364e35_6.1.7601.24384_none_0a9e50b94927e2ca.manifest to C:\Windows\Temp\CheckSur\WinSxS\Manifests\amd64_microsoft-windows-smss_31bf3856ad364e35_6.1.7601.24384_none_0a9e50b94927e2ca.manifest. 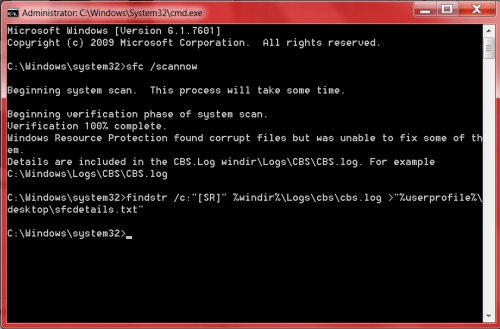 Successfully copied file C:\Users\Admin\AppData\Local\niemiro\Archive\Manifests\amd64_microsoft-windows-system-events_31bf3856ad364e35_6.1.7601.24384_none_64b922c0331fdf01.manifest to C:\Windows\Temp\CheckSur\WinSxS\Manifests\amd64_microsoft-windows-system-events_31bf3856ad364e35_6.1.7601.24384_none_64b922c0331fdf01.manifest. 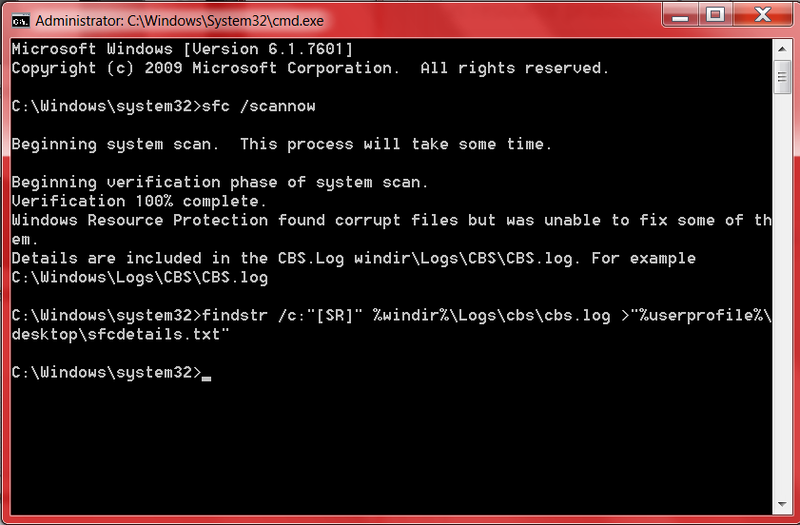 Ok, Now run SURT again from post #2 and post the new CheckSur.log. Run sfc /scannow and let me know the result. Thank You. Amazing work by SleepyDude!! Are there any Windows Updates waiting for install? Can you install them without problems? Download MiniToolBox and save the file to the Desktop. Do you use the Windows Homegroup to share files and printers? Post the generated log in your reply. I do not use windows homegroup for sharing.